Support Keep the Peace, give feedback and share your ideas, and playtest early versions of the game. Join Alpha Team today. You are the Chief of Police. Crime is out of control. The people don't trust you. The mayor is furious. Your officers are stressed, overworked, and underequipped. Do you have what it takes to keep the peace? 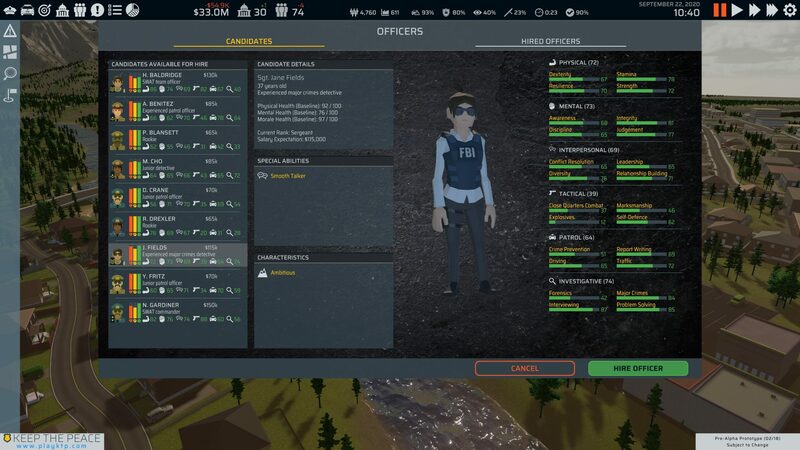 Keep the Peace is an in-depth law enforcement strategy video game under development for the PC (Windows/Mac). You are the police. The city’s security is in your hands. Your decisions will determine whether people feel safe, or live in fear. Your decisions will control crime or let it run wild. Your decisions will mean life or death. Your officers are the backbone of your department. Decide who to hire based on dozens of skills and characteristics. 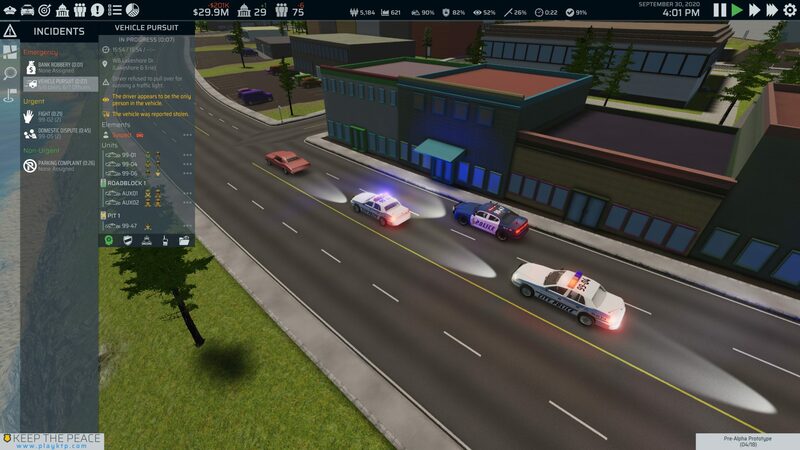 Put your officers into units, customize their vehicles, and choose from a wide range of tools and weapons to equip your force. 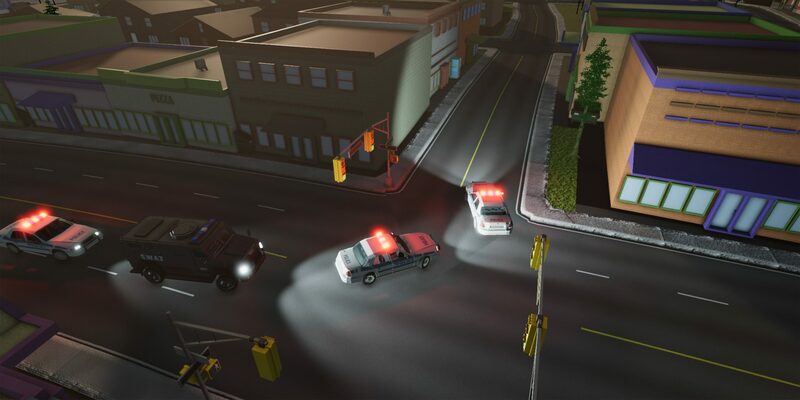 Then send them wherever you need them — assign your officers to patrols, investigations, or other specialized functions. 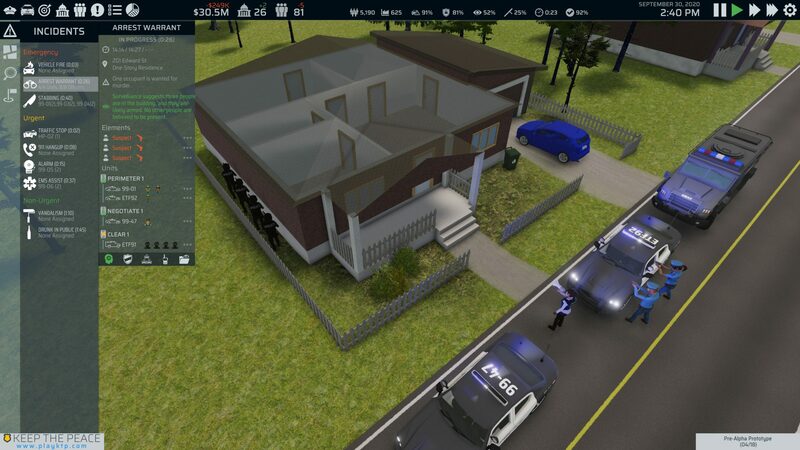 Break-ins, bank robberies, shootings, high-speed pursuits, bomb scares, search & rescue, car accidents, natural disasters… With over 100 types of incidents and investigations, each with virtually infinite variations, you’ll have to be ready for anything. You can’t catch every criminal at the scene. When perpetrators escape, bring in your detectives to track them down. They’ll interview witnesses, analyze forensics, conduct surveillance, and even go undercover. Suspects will get convicted, or walk free, based on your choices. Balance your efforts between preventing crime, responding to crime, investigating crime, and otherwise serving the public. Target crime hotspots with detailed data about past crimes, and launch stings and crackdowns in high-crime areas. Set policies, training priorities, and rules of engagement to create whatever style of police force you desire. We need your help to make KTP into the best game it can possibly be. Keep the Peace is an ambitious undertaking that started as the passion project of a single, independent developer. Now our small team needs your help to bring KTP to life, and we want to involve you as much as possible in the process of getting there. Share feedback and guide development by playtesting early versions of the game way before its public release. Read exclusive development updates, chat with the developers in private forums, make feature requests, and peek into our internal project management system. 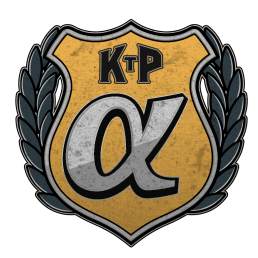 Get recognized for your support within the online KTP community and in-game. Get free or discounted Keep the Peace merchandise such as t-shirts. Have something special within the game named after you, or have a caricature of your face modelled within the game. Alpha Team registration is CURRENTLY OPEN. Which of your friends would be interested in Keep the Peace? Easily share KTP using the buttons below. The more support we have, the sooner you’ll be playing Keep the Peace.